A coach has overturned at an M1 service area in Buckinghamshire leaving six people seriously injured. The National Express bus, going from Birmingham to Stansted, clipped a kerb and rolled over at it entered Newport Pagnell services at 1600 BST. There were 33 people on the coach, and 30 of them were hurt, Buckinghamshire Fire and Rescue Service said. Thames Valley Police arrested the coach driver on suspicion of drink driving and dangerous driving. A Highways Agency Spokesman said the M1 had not been closed. The coach hit a lamppost and a tree as it overturned, said a spokesman for Welcome Break, which operates the service area. First aid was given to casualties by staff members, he added. 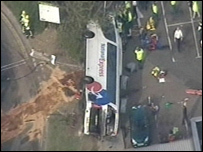 Road and air ambulances have been at the scene and casualties were to two hospitals in Milton Keynes and Oxford. An air ambulance has transported one casualty to hospital. In a statement, National Express said the coach was the 777 service travelling from Birmingham to Stansted, with 33 passengers on board. The coach left Birmingham at 1400 BST to go to Luton Airport and was to due arrive at Stansted Airport at 1755 BST. It had also stopped at Coventry.